The traffic projections used to justify the Paseo del Volcan Extension were formulated 15 years ago. Since then, population growth in Albuquerque has outpaced vehicle miles traveled. In a new report, Highway Boondoggles 2, U.S. PIRG and the Frontier Group profile the most wasteful highway projects that state DOTs are building. The proposed Paseo del Volcan Extension, in Albuquerque, New Mexico, is a textbook example of a project intended to induce and subsidize suburban sprawl. The idea of building a road through the desert northwest of Albuquerque first surfaced in 1990 as a way to enable sprawling development. Getting local, state and federal financing for a road through the vacant region was crucial to the profit dreams of Westland Development, the private company formed to manage an enormous tract of land initially granted in 1692 by the king of Spain to New World settlers. By 2001, a plan for the road had been approved by federal regulators. But in 2010, with the road still unbuilt, Westland Development sold many of its assets at auction. 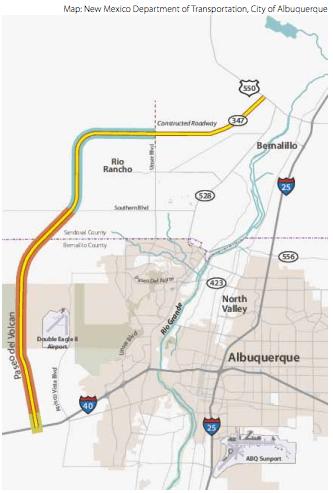 In 2015 the land’s new owners, Western Albuquerque Land Holdings, tried to revitalize plans for the $96 million, 30-mile road, whose route would start near the Santa Ana Star Center on Unser Boulevard in Rio Rancho, heading west and then south through Sandoval and Bernalillo counties to connect with I-40 beyond Petroglyph National Monument. They didn’t bother updating the original document claiming the road was needed. Finalized in 2001, it says, “The 20-year growth projected for northwest Albuquerque and the Rio Rancho portion of Sandoval County would be accompanied by additional travel demand.” From 2000 to 2010, the Albuquerque metropolitan area’s population grew an average of 2.0 percent a year, but vehicle-miles traveled grew far less quickly: 1.3 percent annually, on average. The road would encourage sprawl. It would only “touch the fringes of” the Albuquerque metropolitan area, according to an article in Albuquerque Business Journal. Western Albuquerque Land Holdings already has $30 million invested in water and sewer lines in the Estrella area, through which the Paseo del Volcan would run. And just across I-40 from where Paseo del Volcan would end, the company is proposing a development called Santolina, a 22-square-mile sprawling residential, commercial and industrial project that would include 38,000 homes. That project has drawn significant criticism from residents concerned about how much water the project would require. Rather than build the new road, some local officials would prefer to make modest — and cheaper — changes to existing roads in the area. State officials say that completion of Paseo del Volcan remains decades away and that the money for land acquisition is only a down payment for the loop road. But that hasn’t stopped them from beginning to acquire the land needed to build the Paseo del Volcan. About $8 million in state and federal dollars are slated to be spent by late 2015 to buy 82 acres where an interchange may one day be. Another $22 million of taxpayer funds are expected to be spent on buying property. Western Albuquerque Land Holdings sees so much potential profit from the road that it agreed to donate 3,250 acres of land to allow construction of the road through its holdings. The Pennsylvania Turnpike is hemorrhaging money. The state's transit riders could end up footing the bill for its expansion.